In Dragon, Donnie Yen plays Liu Jin-Xi, an ordinary paper maker trying to live a quiet life in a small Chinese village in 1917. One day some thugs come to town and cause a scene at the general store. Jin-Xi manages to kill them both in a fight that looks mostly accidental. He’s heralded as a hero when it’s discovered that the two men were wanted criminals. Another gang hears of the incident, and is soon on its way to town. Jin-Xi must stand up once again to protect his family and his home. The above description is accurate, and it makes Dragon sound like another run-of-the-mill kung fu film. It’ll be fun, but it’s not doing anything new or different. With Dragon that’s entirely not the case. It introduces a History of Violence-style twist that turns it into a new sort of genre: kung fu noir. 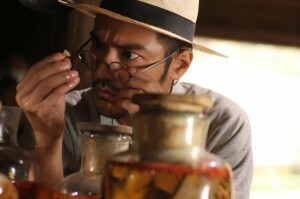 After the incident at the general store, Detective Xu Bai-Jiu, played by Takeshi Kaneshiro, comes to investigate. He’s a breed of detective commonly seen on procedurals: socially inept, detail obsessive, able to see what others can’t. He studies the crime scene and interviews the locals, and concludes that it takes a great deal of skill and precision to kill someone in a way that looks so inadvertent. Bai-Jiu discovers that the cheerful Jin-Xi is actually Tang Long, the former second in command of the 72 Demons, a notorious barbaric, butchering organization of outlaws. Bai-Jiu wants to arrest Jin-Xi for his crimes, but his superiors are resistant. Tang Long is not currently on the wanted list. He’d have to bribe the judge for a warrant, and the men that they’d send with Bai-Jiu to make the arrest aren’t trustworthy anyway. Most importantly: Tang Long is living as Jin-Xi now. He appears to be leading a simple, reformed life. Shouldn’t reformation, not prison or punishment, be the ultimate goal of the law? In Dragon, nothing is what it seems. Sweet family man Jin-Xi used to be a cold-blooded killer. The Master, leader of the 72 Demons, is a twisted, evil man, but he has an unexpected reason for his obsession with Jin-Xi. And while The Master might be our almost caricature of a villain, in many ways Bai-Jiu is the true antagonist. Most of the terrible things that happen in the film are his fault. He’s an obsessive crime fighter, bordering on crazy. He tried to accept a reformed criminal once, and then had to watch said criminal kill an innocent family before his eyes. Now Bai-Jiu uses acupuncture and other methods that he believes suppress his natural human empathy, and focuses on one thing alone: capturing law-breakers. There is no gray to the law, only black and white, right and wrong. Bai-Jiu will do anything to prove his hunch and bring Jin-Xi to justice. That includes things like bribing a judge, and slicing Jin-Xi in the shoulder in the middle of a crowded street. Everyone wants him to let it go, but he won’t. It’s really Bai-Jiu, not Jin-Xi, who brings the 72 Demons down upon the village. Dragon is characterized by strong performances, the two most notable being from Donnie Yen and Takeshi Kaneshiro. Donnie Yen doesn’t play that differently from his Ip Man character: he’s still the strong man of few words. But he brings an additional calm cheerfulness and contended domesticity to Jin-Xi. Never once do we feel like he doesn’t believe he deserves to be punished for his crimes, but he’s such a loving father and husband, such a supportive member of his community, that we want Bai-Jiu to leave him and his family alone. Takeshi Kaneshiro’s face and the character’s further development make up for the typical quirky detective trope. Takeshi Kaneshiro is wonderful as Bai-Jiu. I am biased; I’m a big Kaneshiro fan, and I’ve watched everything of his that I can find. He manages to make me love watching him in Dragon while not at all liking his character. That descent into dislike is gradual. The first half of the film is punctuated by an easy, unobtrusive humor mostly derived from Bai-Jiu’s bumbling. At first we laugh at his awkward attempts at any social grace, but as the film continues, and we see the extent to which he has suppressed any emotion or empathy, we start cringing. Thus Dragon is a kung fu flick and a noir piece, but also a character study on morality. In one scene Jin-Xi leads Bai-Jiu deep into the woods to follow a shortcut out of town. Bai-Jiu’s figured out Jin-Xi’s true identity at this point, and Jin-Xi knows it. Bai-Jiu has also nearly killed Jin-Xi twice, in attempts to confirm that his suspect is more than just a maker of paper. The sky is dark, with dusk or troubling clouds, or both. The forest is dense. Jin-Xi gives Bai-Jiu a hug and a smile, and sends him on his way. Bai-Jiu doesn’t understand why Jin-Xi doesn’t kill him then. The audience almost doesn’t understand either. On the surface, Bai-Jiu is on the right side of the law and Jin-Xi on the wrong. Technically, it’s Jin-Xi’s past that brings the 72 Demons to his little village. In that same past, Jin-Xi was a slaughterer of innocents and children. He deserves punishment for his crimes, and Bai-Jiu is only doing his job to try to bring him in. Who’s right and who’s wrong? Perhaps both, and neither. At the end of the day, we’re on Jin-Xi’s side. We want Bai-Jiu to go away and leave Jin-Xi and his family alone. On paper, morality might mean one thing: right and wrong, within the law and without it. But what is the point of morality without human empathy? Does the former even exist without the latter? What is the true point of the law: just to enforce rules society deems necessary, to protect societal ideals, or to ensure that everyone is granted the ability to live, as best as possible, in peace and safety? Can we blindly enforce these rules, or does each case require individual scrutiny? What is the ultimate goal of imprisonment: protection for the innocent, or reformation for the guilty? How far can empathy go, and how can we ever truly know when someone is reformed? Dragon doesn’t answer any of these questions in broad sweeps. That’s the whole point: there can’t be broad sweeps. We only know how we feel in the case of Jin-Xi and Bai-Jiu. And as for the case of Dragon: it’s an excellent film. Go watch it. You can stream Dragon from Netflix or Amazon.